This entry was posted in craigslist, craigslist.org, Home Remodeling, Refinishing furniture and tagged apple cider, Craigslist, steel wool, vinegar, wood stain by unknowncystic. Bookmark the permalink. Thank you very much. I’m happy with the way it turned out. Not quite exact, but close. The OC table has leaves and isn’t as thick. However, if I lived close, I might be tempted to buy it, refinish it and sell it. However, every time I put that amount of work into something, I don’t have the heart to sell it. Plus, I hate sanding. Even with all the protection, I worry about my lungs. Excellent post my friend, you can now wear your tool belt with pride! While reading I couldn’t help but feel that you would give Norm (New Yankee Workshop) a run for his money. I would post photos of my kitchen build project but wouldn’t want to give you kitchen envy again! I used to watch Norm in his workshop. I am but a flea on his table saw as far as my abilities. Part of my challenge is having the tools to do all of the cool stuff that Norm does, but he’s got the talent and makes it all look so easy getting from point A to B. His line is straight. I take a lot longer to get there and my path is filled with mistakes. You and that friggin kitchen. Argh. That must be the only home improvement project you’ve ever done. Stop resting on your victory, my man. WOAH! Seriously gorgeous. I love the idea of the ACV/steel wool stain… I would imagine it’s a lot less toxic than the regular stuff. I’m pretty sensitive to chemicals, so I’m always curious to know how well alternatives work. 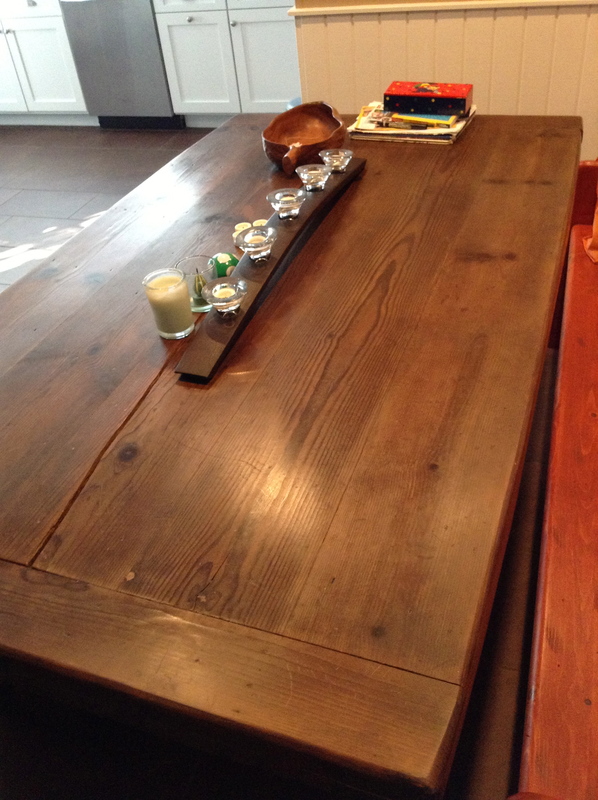 How long has it been since you refinished the table? How has it held up since? Any different than a conventional stain? Thank you very much. I don’t know the science of ACV with Steel Wool vs. store bought stains. I still used gloves with both. However, I didn’t use a mask with ACV, as the vinegar smell, though strong, did not bother me. With store bought stains, I have to use a P100 organic odors mask, as the smell causes problems with my lungs. 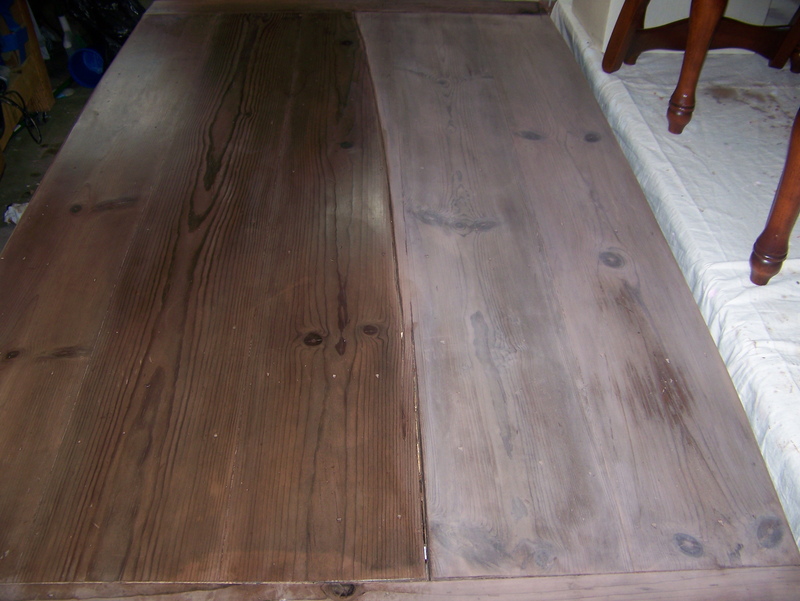 I refinished the table over a month ago and I see no difference in the lasting quality of the ACV and conventional stains. It’s holding up fine. 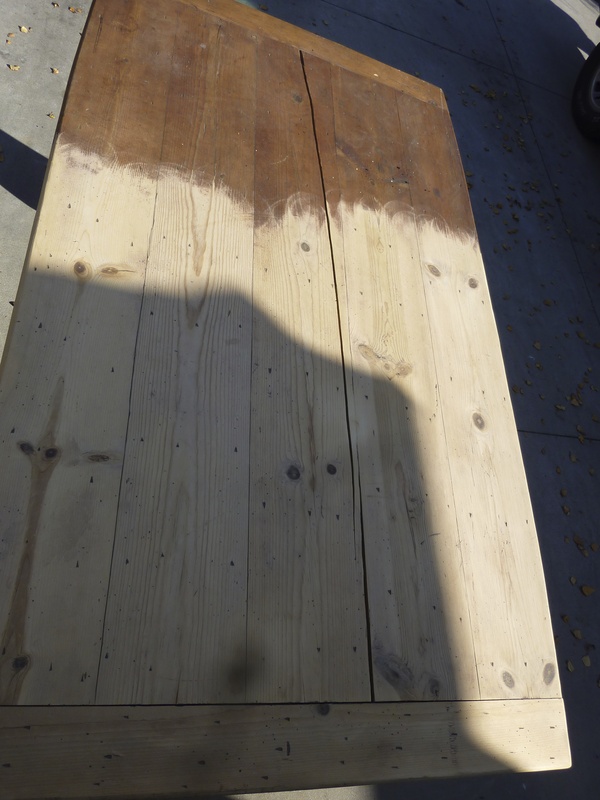 It is a true stain and will stain your driveway and clothes just like a conventional stain. The thing I like about the ACV is that the wood reacts differently to it in places, so you get a better variation of color that you don’t always get with store stains. The hard part about ACV, is how it can be unpredictable in the way it colors wood. A test piece is a must. Some of the samples came out black. However, I did make a bench, post to come, and the bench came out in brown too. I did use liquid plumr. Good to know! I’ll have to file your tips away in my brain. 🙂 I agree – conventional stains are hard on both my lungs & sinuses, hence my interest in this method. Thanks! Great job UC and assistants!! You have every right to be proud of the beautiful outcome. My vote’s on you for Project Master of the Year. 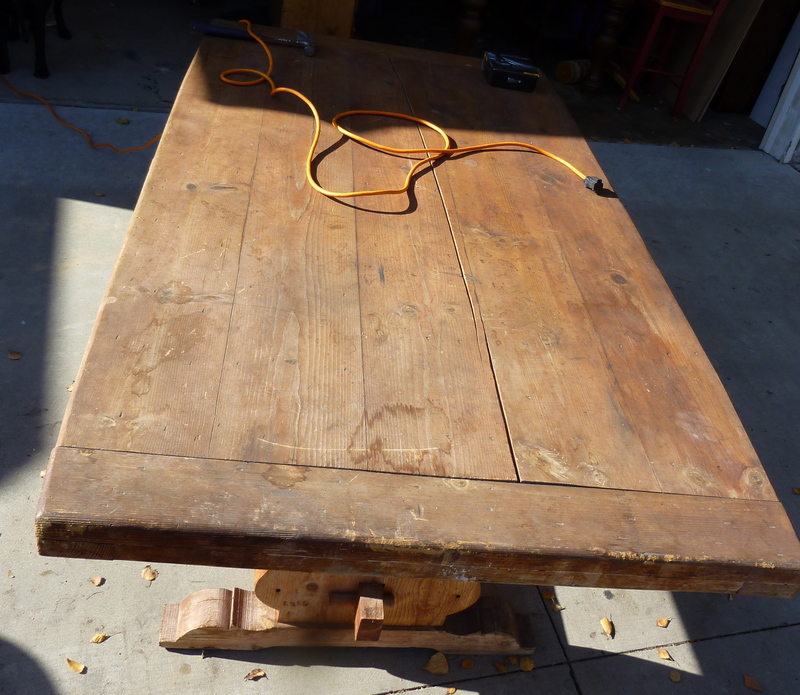 If I ever make the bold move at refinishing another table, I’m gonna try this for sure. Thanks for the excellent tutorial! I appreciate the kind words, as always. I am getting good at refinishing after all of these years of mistakes. But I still have a lot to learn. Sometimes I skip steps I know would make something better but don’t have the tool or time. Let me know if you try it. We’ll throw it up in a post on my site. Nice table! And you were doing so much chemistry in your DIY, it made my heart flutter. Also another tip that hopefully you did not have to experience first hand: sodium hydroxide puts holes in your clothes. It will actually feel like a soapy film on your skin (if you get any on you) before it starts to tingle. Because its kind of soap-like in its chemistry (main ingredient in true soap, actually), it spreads like crazy in the laundry. So, if you spill it on your clothes, wash them SEVERAL times separate from other stuff (best to wash with no detergent) or else you will end up getting holes in clothes you didn’t even wear that day if they are in the same load of laundry. Holey shirttails/pants are a sign of a very tired and hard-working chemistry graduate student (it’s used to clean chemistry glassware). Sorry it’s taken so long to reply. I was on a business trip when I read it and forget to respond when I got back and then went right to my sleep test. Apologies. I’m glad you’re impressed with my chemistry skills. 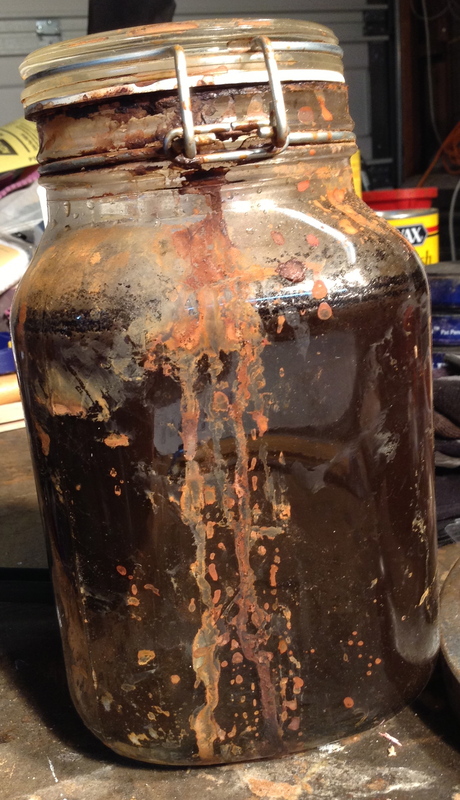 The time I mixed and heated apple cider vinegar, steel wool, and dynamite was a disaster. Hmm, interesting about the sodium hydroxide. Sometimes some my clothes has these odd spots where the color has worn away and pink shows up. I’m wondering now if I should have skipped blaming my wife for poor washing skills. Hmm. Haven’t seen any holes, but liquid plumr has only a percentage of sodium hydroxide. Thanks for telling me this. I will now start wearing plastic bags when I use Liquid Plumr. Hope you are doing well. It’s time for my massive read of your blog. I binge on it. I’m not sure challenging your husband like that is necessary. I’m thinking your charm and good looks would be enough to sway him to build you anything your heart desires. The ways of men and women must work differently down there in Australia. 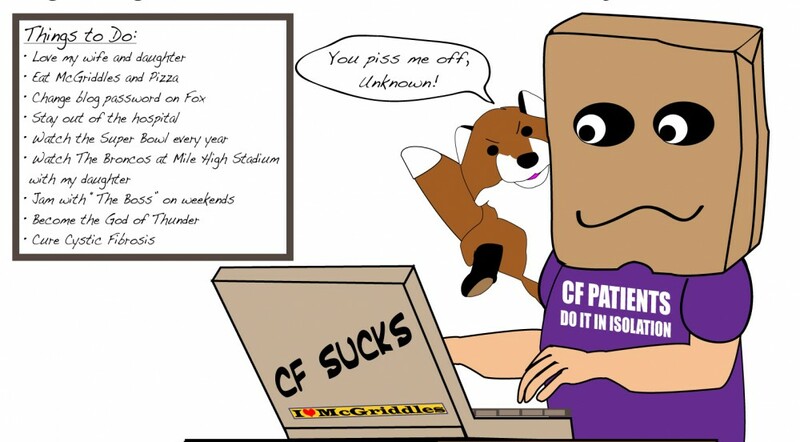 Do you have craigslist down under? it turned out amazing. I too found this DIY recipe for the stain. I am looking for the right project to use it on. Thank you very much. I also used it on a bench, which I haven’t posted yet, and it turned out great. Good to know you had no change after letting the steel wool soak for a day. I kept reading 24 hours and I’m on hour 36 with no real change. JT, I shook mine everyday. And make sure you use real steel wool. If you have some sample sticks/wood scraps, test the mixture on them. It starts out kind of clear but darkens the wood once it dries. Thanks for reading and the comment. If you have a picture of your finished project, please send it. I’m curious how it looks. 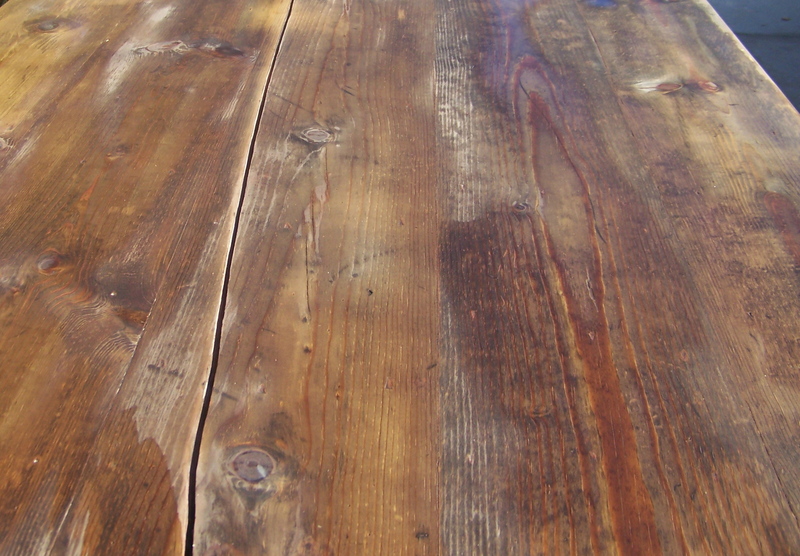 do you sand between stain and wax? i’m in the middle of staining wood and just wanted to know if i should lightly sand between waxing? 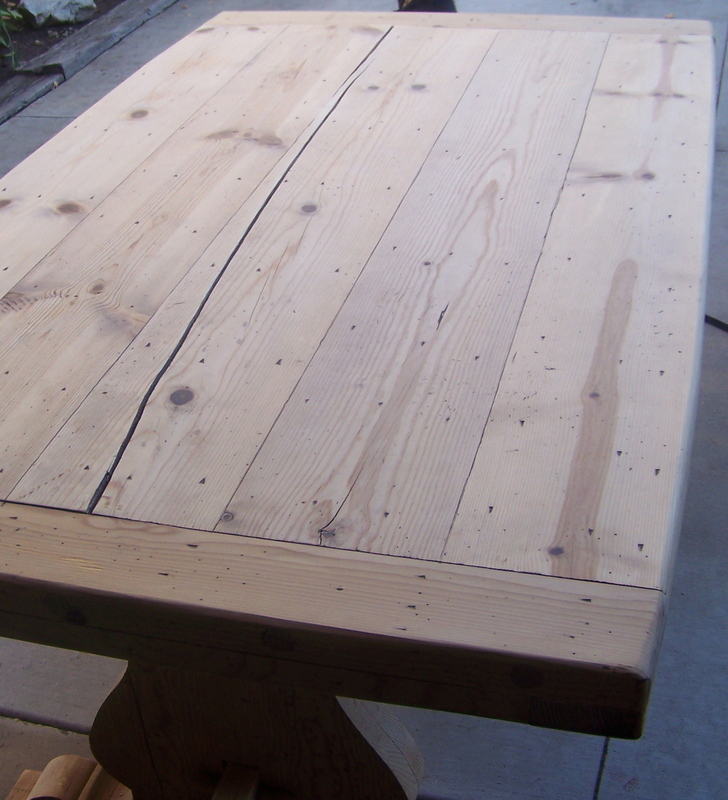 I have never sanded during/after staining on anything. However, I guess it’s a personal choice and the look you’re trying to achieve. 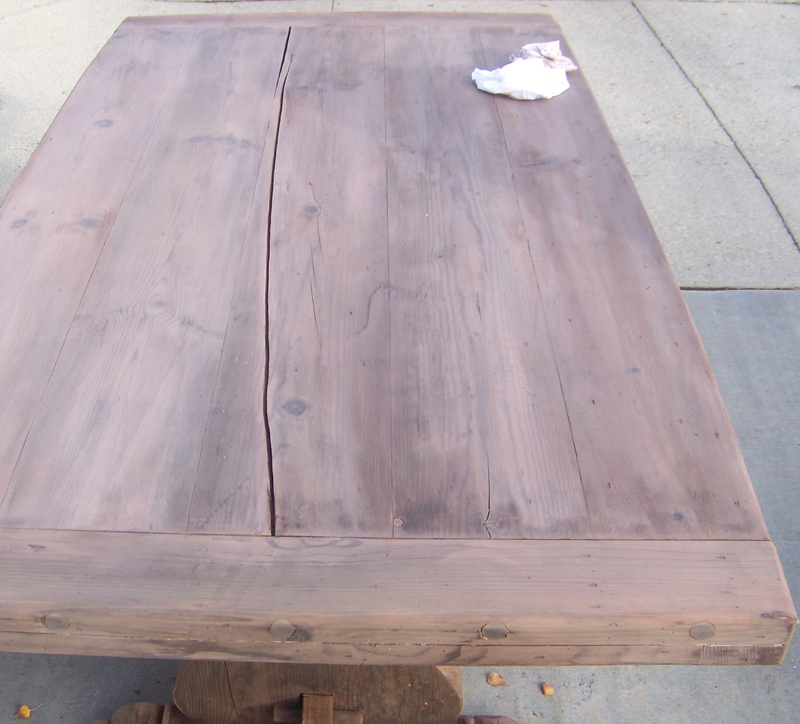 If you wanted a distressed look, than sanding would be the way to go. The only times I sand are preparing the wood piece and during the finishing depending on the coating. 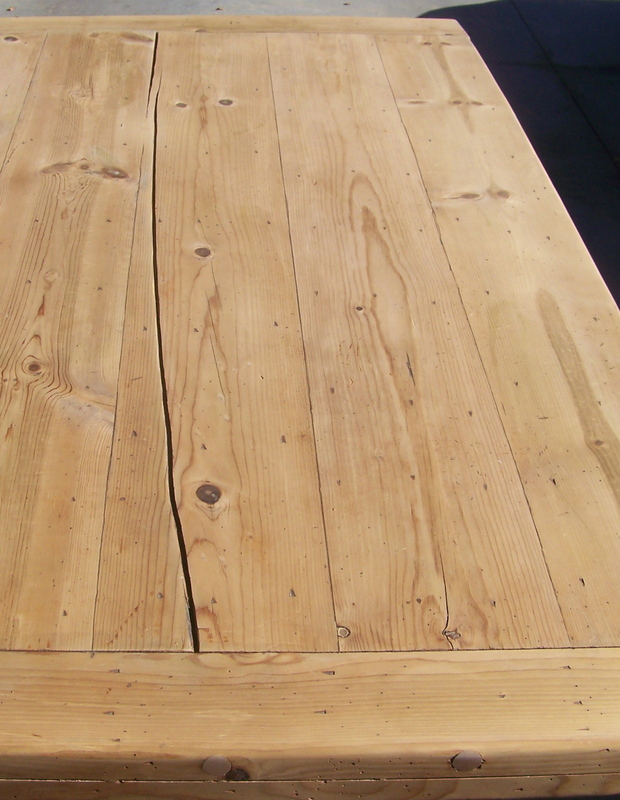 For example, I used tung oil and sanded lightly between coats. With the wax, there is no sanding, just a lot of rubbing. When I use the Apple Vinegar stain I just make sure it doesn’t puddle. That is the biggest challenge. Nice job and technique. Definitely worth a try. Nice job! For several weeks now I have been trying to gear up for making sliding barn doors for a client of mine. She is a designer and partner at Inspirations: Home Decor & More. http://www.inspirationsraleigh.com . I make beautiful things for the interior design market, and she has been a client of mine for almost two decades now. I love the aged, grayed look that the homemade stains make, so I boned up on the “how-to” and bought my gallon of white vinegar, dropped in one of my “0000” steel wool, and waited. And waited, and waited, and…………….. Nothing like what everyone kept stating. Now I’ll admit that it does tend to age the wood, but nothing like advertised. I had been thinking that perhaps apple cider vinegar might be a better choice. I use it on any mole, wart, or dark spot that appears on my face, and after about a week, they all come off and the skin is as fresh as a baby’s behind. I love that Apple cider vinegar. So it was great confirmation to know that you have had great results with your recipe. I am definitely going to go out today and pick up another gallon of vinegar, but apple apple cider vinegar instead. If it will eat up warts, blemishes, and moles, on the skin, it should work wonders with steel wool, which is ‘Fe-iron’. Add a solvent and you quickly have loads of ‘Fe3O2-Ferri coxide’.